I tend to get a little sad after the July 4th holiday. Here in the middle of Kansas it means the kids will be starting school soon. They all go back the middle of August, and these last weeks will just seem to fly! My two older kids are gone this week on our church’s mission trip to Joplin. Then my husband and son will be gone the first part of August on a Boy Scout trip to Philmont Scout Ranch in northern New Mexico. Next it will be back to school shopping….I don’t even want to think about it! So I won’t. Instead I will share this delicious Cherry Cobbler with you. As those of you who have been with us awhile know…I am not a baker. (My husband tells me to quit telling you that, but we have so many new readers I just want to get them up to speed.) I actually like a cobbler better than a pie anyway. I love the crunchy sweet topping. Don’t limit yourself to just cherries– use 6 cups of whatever type of fruit you would enjoy. I’ll also let you in on a little secret. I use the frozen cherries that are already pitted. (I would definitely skip the can of pie filling, but that’s just my personal opinion.) The whole pitted frozen cherries will make your life so much easier. In a medium bowl mix together the oats, flour, brown sugar and butter until crumbly. In another bowl mix the Cherries, sugar, cornstarch, cinnamon and lemon juice and mix well. Pour cherry mixture into a buttered 2 quart casserole dish. Top with the oat mixture. Oh how I love cobbler with oatmeal in it. This sounds sooo tasty…great for summer. Oh this looks delicious! Stopping by from Facebook to look at your great blog! enjoy your day. Thanks so much! I’m on my way to check out your blog! Thanks Tara! I really appreciate it! Have a terrific week! 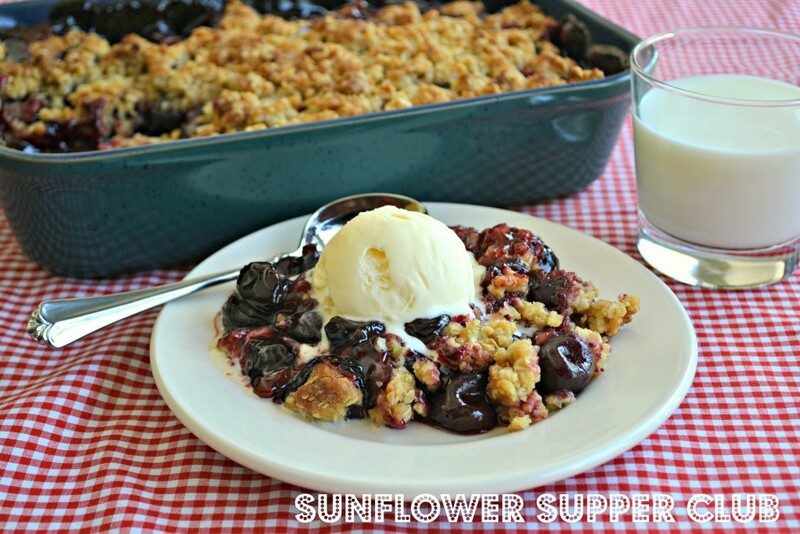 I love your cobbler, with crunchy topping, dark pitted cherries, ans Ice cream on the top. Yum! Great idea to use the frozen cherries, otherwise you end up with red fingers, pitting the cherries. Your right Becky! Thanks for stopping by! i just bought a huge box of cherries – now i know exactly what i’m going to do with them! I think you will enjoy it! Thanks so much for stopping by. I’m off to check out your blog! Yum, I love cobbler, and cherry cobbler? The best! I love cobbler!! I may sneak next door and pick some cherries LOL Thanks so much for posting these on Manic Monday!! 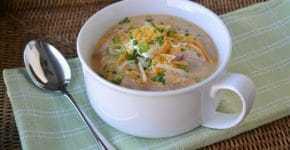 Thanks for joining the fun with these great recipes of yours! Come back next week to Foodie Friends Friday! Our kids go back the middle of August too. This summer is just flying by! I love cobblers too…something about that buttery crunchy topping just does it for me! Thank you so much for sharing on Trick or Treat Tuesday! !